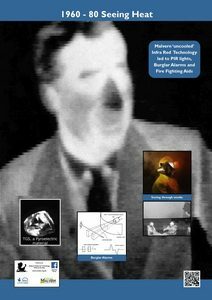 Infrared energy has been known about for many centuries, but it was not until the advent of electronics in the 1920s that the dream of making infrared images was possible. Unlike conventional photography and the operation of our eyes, forming images using infrared energy does not require sunlight, in fact it works perfectly well in total darkness. This was not lost on the military strategists and attempts were made to form infrared images before the second world war. During this conflict, priority was given to radar research as it promised a much longer detection range and bombers were the main threat. Later in the war, Nazi submarines were escaping detection by using snorkel tubes to draw air to their diesel engines when charging their batteries instead of surfacing. The snorkel tubes made a very difficult target for allied radar sets to pick up and infrared detection of the hot exhaust gas was proposed. Even then it took many years before real-time video images like the ones seen on programmes like “Police, Camera, Action” were possible. TRE started work in the 1940s and was at the forefront of many developments well into the 1990s. There are two basic ways of detecting and exploiting infra red energy, the first is by counting the photons (tiny packets of energy that carry the infra red information) and the second is by measuring the change in temperature that the infra red energy causes when it strikes a specially made structure. The first method, often called ‘Photon Detection’ gives the highest performance, but the detector has almost always to be cooled to very low temperatures. This leads to its other name of ‘Cooled Detection’. The second method, often called ‘Thermal Detection’ still gives a good performance, but it cannot match the performance of the Cooled Detectors. As these detectors do not usually need cooling, it is also referred to as ‘Uncooled Detection’. Equipment based on Uncooled Detection is almost always cheaper, lighter and less bulky. The first infra-red images were very crude and only consisted of a few tens of pixels, even these images took many minutes to form. It was not until the 1960s that uncooled detectors were sufficiently fast-responding to enable real-time images to be formed, but other applications were also being researched. 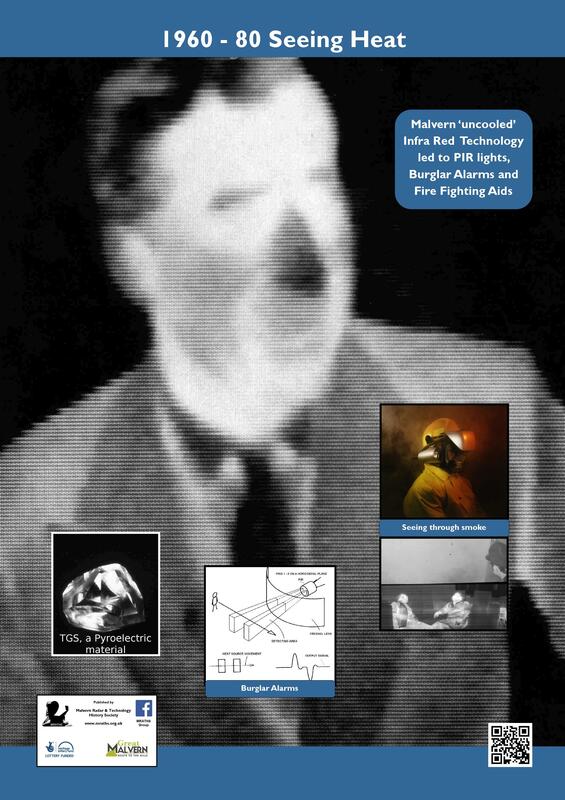 The simplest application of Uncooled IR Detectors was as single-pixel detectors in ‘burglar alarms’. 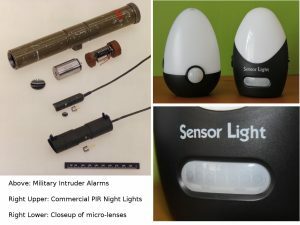 Firstly to alert soldiers on sentry duty to the approach of the enemy and later as the Passive IR, or PIR, detector that many of us have in our homes and businesses, either as part of a burglar alarm system or to switch on a light on the drive or patio to welcome visitors or deter criminals. 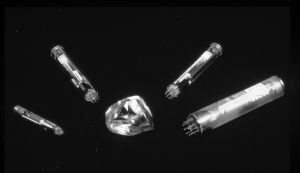 Detectors of this type are also used in exhaust gas sensing for MoT testing, medical in-ear thermometers, so-called ‘Point-and-Shoot thermometers and other scientific instruments. 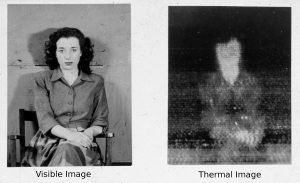 The early work on imaging with the Uncooled IR Detectors was a competition between linear arrays of detectors that were scanned across the image, much like a document scanner and a device called the Pyroelectric Vidicon which was based on the TV camera technology of the day. The Vidicon approach won out and became a commercial success. 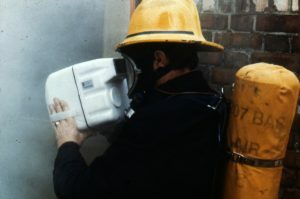 RSRE, as the Establishment had become, had been working with the London Fire Brigade on Infra-red cameras to enable Fire-fighters to see through smoke. Initial experiments about 1970 with bulky, laboratory equipment had proved the point and RSRE teamed up with EEV (now E2V) at Chelmsford to produce a commercial camera. This became the EEV Fire and Rescue Camera which was engineered to full Fire safety standards through a grant from the Home Office. Sadly the Fire Brigades were too conservative and cash-strapped to buy them and most of the first batch were left on the shelf. However, following the loss of HMS Sheffield to fire in the Falklands Conflict, the Royal Navy were in urgent need of a camera that could see through the thick smoke of a ship-board fire and snapped up all the available cameras from EEV. They were soon followed by the US Navy and sales grew rapidly. The Pyroelectric Vidicon based camera and its derivatives went on to sell over 10,000 units. The combined RSRE and EEV team were granted a Queen’s Award for this technological achievement. RSRE then went on to team up with the Plessey company (now part of SELEX) and developed 2D arrays with silicon-chip based readout electronics. These devices were similar in operation to the chip at the heart of a digital camera, but with infrared-sensitive pixels allowing produced real-time video images. 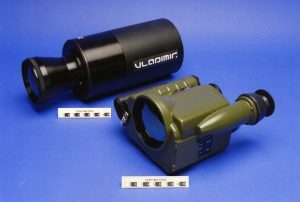 This technology enabled the infantry’s LION thermal imaging sight that was so successful in Bosnia. It also went into the following generations of EEV Firefighter’s cameras as well as the Cairns IRIS which sold in hundreds to the US fire brigades. The combined DERA (as we had become by then) and Plessey team won the Prince of Wales Award for Innovation for this technology (hence the thermal image of the Prince in the background of the poster).